W M Robertson, 1905. 2-storey, 5-bay, rectangular-plan, symmetrical, classical office block with curved corner bay balustraded between outer pediments, bowed to W. Red ashlar sandstone. Base course, eaves course, mutuled cornice. Chamfered margins and moulded projecting cills to openings. S (PRINCIPAL) ELEVATION: 5-bay; semicircular-arched windows to 3 centre bays at ground floor with projecting keystones, square-headed windows to upper floor with consoled cills. Symmetrical, slightly advanced outer bays; consoled segmental arch pediments breaking eaves to coped parapets. Consoled canopy to entrance to outer left bay, 2-leaf timber panelled door, window to outer right bay. Balustrade over central bays. Bowed corner bay to left return; stone mullioned bipartite stair window to centre. N (REAR) ELEVATION: not seen 2001. E (SIDE) ELEVATION: obscured by abutting building. Predominantly 12-pane sash and case windows with 9-pane grid pattern below arch-heads of principal windows. Low, double pitched roof, grey slates, lead flashing. Coped stacks to sides. 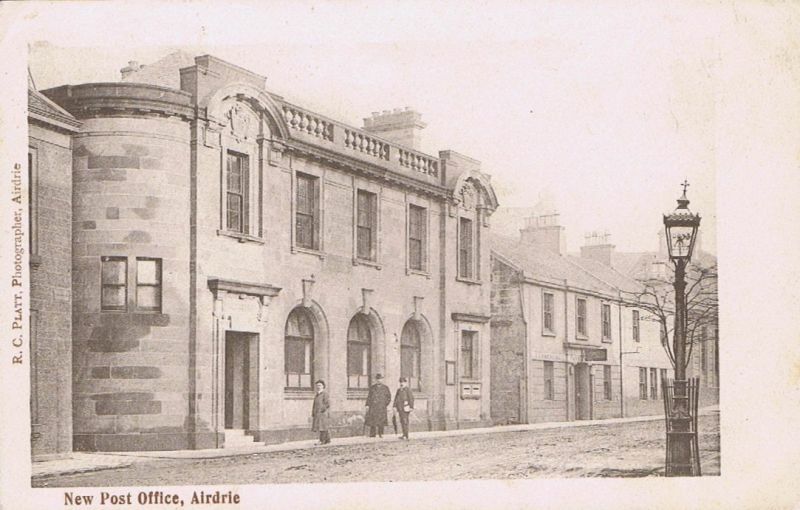 Built as Airdrie Post Office. Robrtson designed numerous buildings for the Post Office.